An assortment of cocoa dusted truffles. Curiously moreish. Great taste 2015. Flutter Scotch truffles. 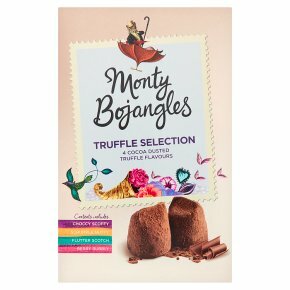 Suitable for vegetarians.The curious adventures of Monty Bojangles... A delicious collection of individually wrapped intensely chocolatey truffles gathered during my mind beguiling Taste Adventures Monty endeavours to ensure all flavours are included, however on occasion the selection may vary.